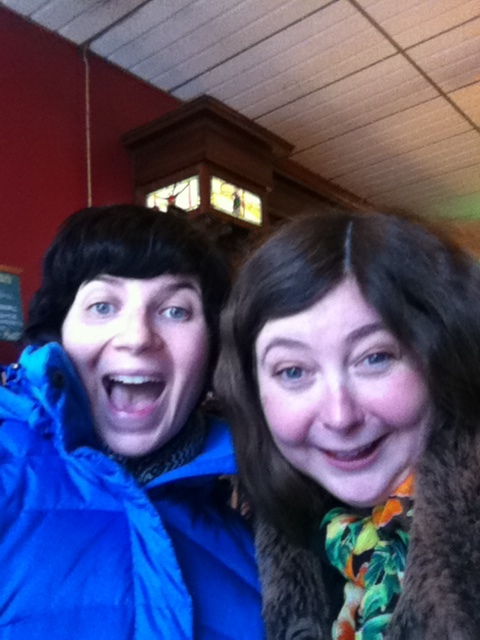 Today I had the distinct pleasure of sharing latkes and hilarity with the singular and singularly awesome Clarissa. “You look like the daughter of the person in your picture on your blog,” she says. Well, what can I say? The glasses give me gravitas. Speaking of which, here’s a selfie in Koppermann’s, post-latkes (I ate all mine and half of Clarissa’s, plus a bowl of matzoh ball soup). You can tell it’s a selfie because I’m rocking my Selfie Face, or as my mom puts it, “that stupid goddamned look you do with your mouth hanging open.” Guilty. All my afternoon clients cancelled today and my editor at Slate doesn’t want this week’s “magic” until Wednesday, so I have a rare afternoon off, but even the knitting/TV watching I’m about to do will still pale horribly in comparison to my awesome lunchtime funz. Was following the reportage of the parking-space altercation on Twitter and would kind of love a blog post on it. Sounded spectacular.